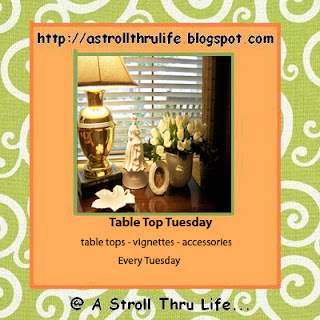 So glad you are all here for the 82nd Table Top Tuesday. I have been sleeping non-stop with all the medications I am taking for pneumonia. This stuff is the pits, however I am making progress. The doctor said today that my lungs are 85% clear and my fever has been down for 2 days. Yip-Skip!!!! I am kicking this stuff. With everyone starting to do their Fall decorating, we had some of the most beautiful vignettes and displays last week, so I thought we would highlight a few of those. There were also some brand new bloggers that joined us, so I hope you will also go and give them a huge hello. 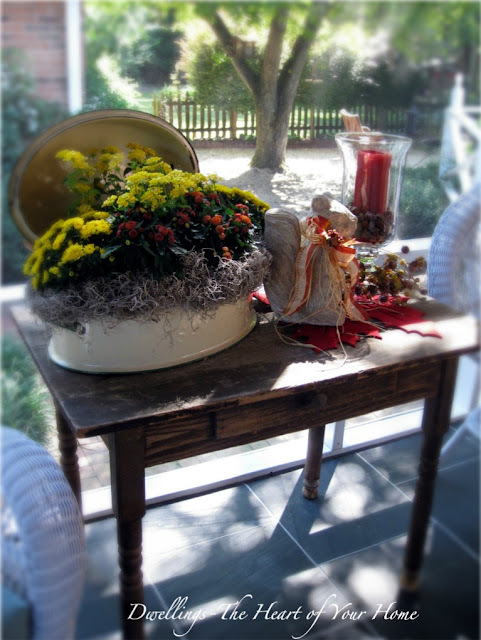 This beautiful table done by Diane @ Tablescapes by Diane just screamed fall to me. I love everything. Notice that fabulous centerpiece, and she even worked some corn into the floral arrangement. How great is that. I love this entire fireplace and the way she decorated the hearth as well as the mantel. So pretty. Go check out Cozy Home Scenes to see all of it. Now I could just sit here all day and enjoy these lovely surroundings. Can you believe how creative this is to use a roaster for this fabulous floral arrangement and then the precious squirrel and candle finish off the perfect vignette. Dwellings - The Heart Of The Home always has such lovely things to see. Be sure and visit. This last week we also had 5 really Newby Bloggers that joined the party, and they all had great inspiration to share. Be sure to stop by and say hello. 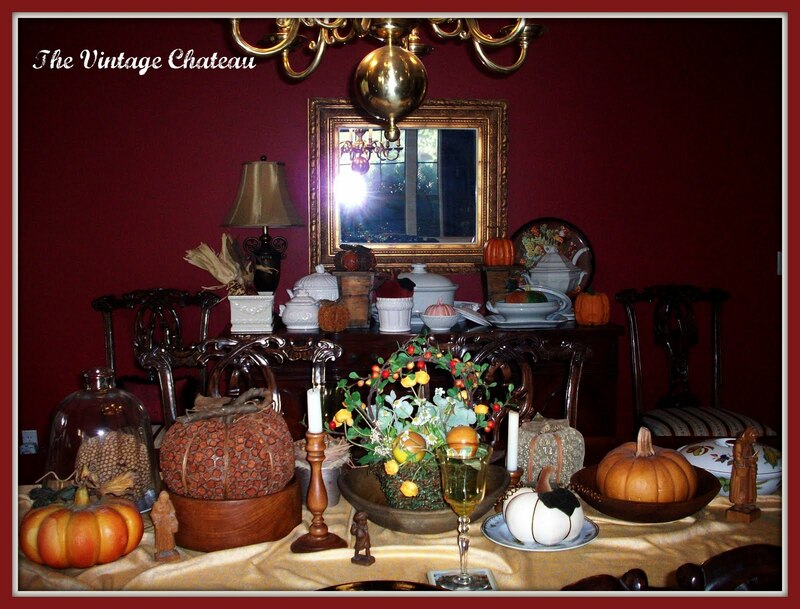 The Vintage Chateau had several vignettes to share using some of her pumpkins and beautiful fall decor. You have to see it all, fabulous. A Tiny Cottage On Grand uses a vintage rhinestone pin to give her tablescape a realestic spooky touch for halloween. Such cute ideas that you don't want to miss. The Essence of Home shows us the beauty of how opposites attract with several vignettes and some gorgeous pictures. Great decor. Cherish Dream Live shows us that simple is sometimes the most beautiful of all. Just a few elements of nature from the yard and it is breathtaking. 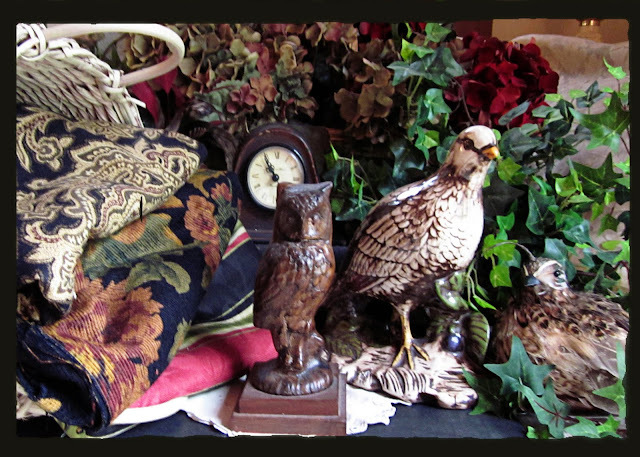 Elegant Economies created some beautiful vignettes using gorgeous textiles and some fabulous old luggage. Pay her a visit and see how creative she is. There is always so much to see each week and everyone is so creative. You really need to set aside some time to visit as many as possible, the inspiration and drool power they show each week is worth more than a dozen design books could possibly show. I am always totally amazed. Thanks again for all the good wishes. I will visit as much as I can. and thank you all so much for linking up. Awww...I'm sooo glad to hear that you are starting to feel better, dear friend! Pneumonia is a terrible thing! Continuing to send up prayers for you...feel better, Darlin'!!! Ohh my...how very sweet of you to continue to host TTT even though you are sick! I sure do appreciate you, dear friend! I just adore each and every blog post that you showcased this week! And...I will be sure to go by and welcome the newcomers! Thank you so much for sharing these lovely blogs and inspirational ideas with us! You are right, I have found sooo many blogs that are just as good...if not better...than the design publications...such as your gorgeous home, my friend! Thank you again for hosting TTT for us! Wonderful features~ I'm off to take another peak. Glad you're on the mend~ hope you're back to normal soon! Sorry to hear that you have been battling pheunomia. Glad that you are doing better. All of the features are lovely. Will be visiting for sure! Hope you're feeling better by now. I love that mantel! Thanks for hosting and take care. Thank goodness you're improving daily!!! I will stop by and visit as many of the featured bloggers as possible this week. You are such a dear heart to showcase their talents...and to share them with all of us. Thank you, again, for hosting this inspirational weekly meme. Hot tea and jammies are in order for you for a few days longer! Prayers coming your way! What a horrible illness to have to go through. Glad you are starting to feel on the up. Thanks for hosting each week. It's a party I try not to miss. Good luck with your continued recovery. Marty, so glad you are getting better. That is really hard to kick. Great features and thanks for featuring my sister. BTW, her blog is not highlighted and linked. Also, not too sure what skiing has to do with Tabletop Tuesday in the link before mine? What a pleasant surprise to see you featured me on your blog! I just linked a post to your party today too. Thanks for hosting it and helping to showcase my blog! Wonderful features! Thanks so much for hosting. Good to hear you are better! Marty, so sorry to hear you are sick. Keep getting better. 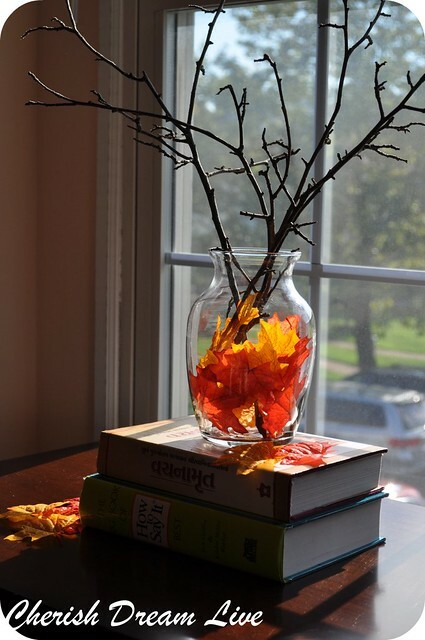 I just love everyone's Fall decor - I still have beachy things up! Need to get to work. Truly, you are amazing to go ahead and host the party even when you are so sick. Hope you heal quickly. I've been worried about you Marty. That is scary. I'm glad you are getting better day by day. Thanks again for hosting! I always enjoy your great party. So glad to hear your on the mend. And aren't you the trooper to still post, you are amazing lady! Love the ones you showcases, so gorgeous! Hi Marty, so glad to hear that you are feeling better! Great features this week and thanks for hosting. So glad to hear your getting better! Lovely features! I am impressed you haven't took some time off of posting. Continue to get better! Thanks for having us! What a trooper! Hosting thru the pneumonia..I sooo enjoy these Tuesdays, thank you so much. Wishing you better health. What a great surprise Marty, THanks for the feature. I truly appreciate it. I will grab the featured button. I truly hope you are feeling better soon and thanks so much for hosting. Linking up few table tops from my bedroom. I would like to thank you sooo much for putting my Small Touch of Fall Tablescape on your 82nd Table Top Tuesday~~~~ Marty you are so sweet to me. Thanks one more time. I'm glad you're feeling better, Marty! Thanks for hostessing another fun Tuesday! Marty these fall photos are so pretty!! So many talented people in blog land! Marty, I'm happy to hear you are better. After all the medications all the sleep is the next best thing for your continued recovery. Thanks for sharing all the great features from last week. Great inspiration for those of us who are not finished with fall decorating. Thanks for hosting and take care. So glad to hear you're doing better! Thanks for taking the time out to do the party! All the fall decorating is just amazing! Since you were so gracious enough to feature my post on your blog today, I wanted to grab the "I've been featured" button and put it on my blog. However, after I copied the code below the button and pasted it into my blog, the picture never showed up. I wondered if there was something wrong with the code. Kim (my sister) tried to do it and couldn't either. I hope you are 100% very soon! I think a good rest is essential so please do! I think your shout outs look inspirational. I'm going to take a little clicking side trip. 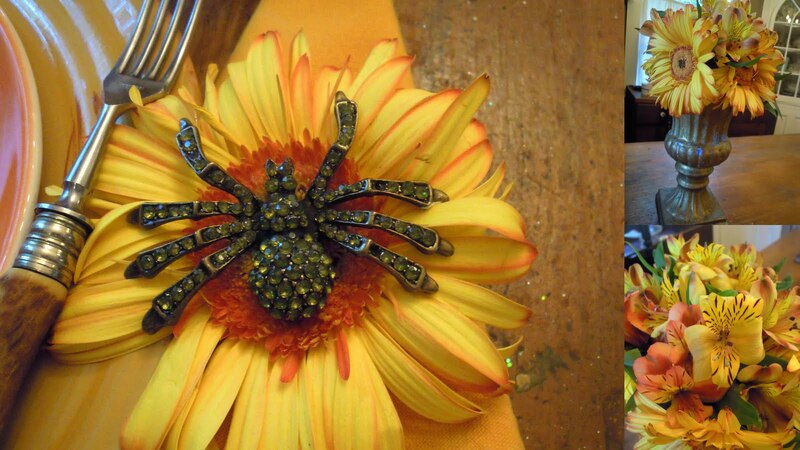 What a great surprise to find that you have featured my fall centerpiece & spider post last week. I am so flattered. Thanks for sharing, your generosity and kindness never seems to surprise me. I have read your blog for a while and know you get around and are always so kind to help us newbie. Thanks also for hosting the linky parties it is a great way for us all to make new friends. Glad you are better and seeing good results. Thanks for hosting! There are so many talented bloggers out there. Nothing to contribute again - no decorating going on around here. :( Take care of yourself! I remember the meds I took when had walking pneumonia - slept a lot! However, that is an important step to recover. So sorry to hear that you have pneumonia. Man, it sure gives you a beating. sounds like you're on the mend. Oh sweet lady, I'm so happy you're feeling so much better, my goodness you are very strong my mother says because pneumonia it's certainly not a common cold to beat!! God is good! I have visited a couple of the new comers, so I'm looking forward to visiting the others. Beautiful features! Thank you for hosting and having me. Please take care. I'm finally have some fall decor to share, so I'm joining in again! Thanks for hosting! Hope you're 100% in the next few days!! What fun features...just what I needed. I wondered why my mantel wasn't looking right, and I think I figured it out from seeing the great ones you showcased!! Thank you!!! Hi Marty! FinallyI remembered to link up to your party and to become your newest followers! Been meaning to do it and keep missing and forgetting!!! Thrilled to be here with all this gorgeousness and thank you for having me! Marty, I'm happy to hear that you are improving; pneumonia is a tough illness. Thanks for hosting today, and get WELL. I love the spider on the sunflower! How adorable! You are quite the creative woman. And your pictures are gorgeous. So glad to hear you are feeling better! Thanks for hosting again - love your parties! Glad to hear you are feeling better Marty. Great features, thanks for sharing. So glad you are getting better. I get pneumonia almost every winter despite taking the shot and it is scary! Thanks for hiliting new bloggers for us to visit and for hosting. OH my goodness, Marty!! I'm so sorry! I have had pneumonia twice and it's SO HARSH on your body! I hope your feeling better soon. I know the dryness of AZ is pretty rough on it too! Take care. I am so happy you are feeling better. You are so dedicated to keep the posts coming, even when you are ill. Your showcasing these beautiful blogs is very inspiring and so generous! Marty, I'm so happy to hear that your lungs are clearing up! Praise God!! Pneumonia is terrible, and walking pneumonia can be dangerous--I'm glad that you're taking good care of yourself. Thanks so much for hosting Tabletop Tuesday every week! You're such a gracious hostess. You've featured some real beauties this week! Hi Marty, thanks for hosting your party. I went to click on Dianes tablescape, and perhaps I am losing my mind, but it took me to my blogger profile page????? ?Please check that. You are ill????? What's wrong..what have I missed!! Oh dear! Isn't it amazing how thoughts turn to the colors of fall this time of year? The season does provide a wonderful palette with which to work. Treat yourself kindly as you recover. so darn sorry your sick with pneumonia that is bad stuff i know. Love all the table tops so pretty. Hi Marty, Sorry to hear about pneumonia. Hope you feel better soon. Sipping on some green tea also helps a ton. Wonderful fall decorations. always enjoy reading your blog posts. so glad your feeling better! So sorry you had pneumonia. That definitely doesn't sound fun. You win the blogger of the year award for still hosting your party while sick! Hi Marty!! I finally got a little decorating done so I could join your fun party!! So sorry to hear that you were sick- I know that had to be hard for you as you are always going a million miles a minute. Glad you are starting to feel better. Thank you Marty for always being such a great hostess even when you are not feeling well.- Love you friend! So hope you continue feeling better Marty. Thank you so much for the feature, so sweet of you!